We have an amazing team in Aalst. Our team is a perfect mix of developers, hardware specialists, professional teachers and people that are just really enthusiastic about CoderDojo. Not forgetting our superb cooks who make sure that the coaches can concentrate on teaching. My team is a happy bunch of ladies, gents and ex-ninjas ranging from 16 to 60. I love all of them. This team of 20 people makes our Dojo very much alive and fun each month. Our young coaches, Robin and Arthur were scratch starters a few years ago and now they are teaching others mBot and Mindstorms. A few other ninjas start coaching next season. These youngsters started with us a few years ago and it is heartwarming for the other coaches to see them getting mature as our Dojo does. This motivates the somewhat older coaches and certainly the ninjas. If you would design an ideal team to teach a variety of skills to 30 to 40 kids, the team in Aalst would come very close! Enthusiasm drives a Dojo and is very contagious. Jo’s tip for other leads/volunteers: happy mode on! On the day of the Dojo, you need to have your happy mode on. Every time you meet your ninjas, their parents, your coaches or your cooks, you need to be enthusiastic. Show everyone, openly, how happy you are with your amazing Dojo. I know that this skill is very often rare to people in IT and everyone can have an off day. I had to practice this skill as well. However, as a coach and especially as a lead coach, it pays off to do this resolutely every time. Enthusiasm drives a Dojo and is very contagious. When a Dojo is on a roll, it is not hard at all to be enthusiastic. Practically: Be very expressive, applaud during a show-and-tell and congratulate kids personally on their great work. When you do an opening presentation, talk about the cool upcoming events (Coolest Projects, Scratch day, local events, special events from other Dojos) even if you know that nobody is attending the event. They certainly won’t if you are not enthusiastic about it. Smile, praise, compliment, welcome and thank your volunteers for helping out and your ninjas for working hard. 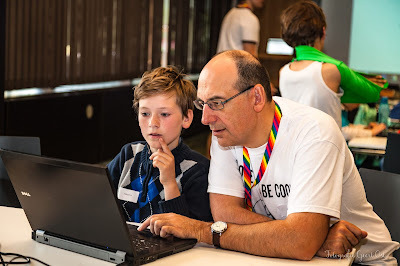 This fun-warm-passion is one of many things that makes CoderDojo unique and it is your ideal tool to attracts kids and volunteers.